Carbon Credentials has published our 2018 CRC Guide to help participants through the final year of the scheme and beyond. We are now in the reporting season for the penultimate year of the Carbon Reduction Commitment Scheme. 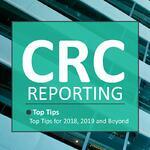 Download our guide for reporting top tips and insights on what is likely to replace CRC. We also include details on other mandatory and voluntary carbon and energy reporting frameworks, which are likely to be increasingly important in the future. What energy supplies are reported in CRC?